Để đọc và hiểu rõ hồ sơ tàu, tài liệu ta cần hiểu về một số thuật ngữ phổ biến dùng trong giám định mớn nước để tham khảo. Vì hồ sơ tàu viết bằng Tiếng Anh nên mình để định nghĩa các từ ở Tiếng Anh. Aft Perpendicular (AP): an imaginary vertical line, at right angles to the keel, passing through the first frame and so located on or nearby the ship’s rudder post. Ballast Tanks: tanks aboard the vessel specially designed to receive ballast water or, in the case of tanks vessels, cargo tanks used to contain ballast. Boiler Feedwater Tanks: tanks provided aboarf the vessel to contain water used for the production of steam. Bilges: spaces at the bottom of the engine room or pumprooms where water is allowed to accumulate. As the bilges usually also contain waste oil, they may not be discharged within the port limits. For draught survey purposes, the quantity of liquid in the bilges’ should be controlled/sounded before and after loading or discharge, so that any change in quantity can be detected. Bunker tanks: tanks intended to contain fuel oil either for stam raising purposes or for the provision of power to the main engines and auxiliaries. Calibration Tables: (see sounding table). Centre of Floation: the point around which a ship tips, often called the tipping center. The center of the waterplane area. Cofferdams fwd and aft: these terms apply more particularly to ocean tankers, coastel tankers and tank barges. They are empty spaces provided in order to separate the cargo tanks from the machinery space aft and from the forward peak and other forwardparts of the ship. Cofferdams frequently contain water, either intentionally or accidentally, and should therefore always be sounded. Constant: the difference between the light ship weight according to ship’s documents and the net empty survey displacement after deducting all measurable weights. Deadweight: the weight of a vessel’s cargo, fuel, water and stores. Deckline: a line clearly marked on the port and starboard side of the vessel, amidships as required by International Loadline Regulations. Deeptanks: tanks situated near to the bottom of the vessel. Density (true): the mass of a volume unit of a liquid. Displacement table/scale: a table, specially prepared for each vessel, giving the displacement corresponding to various drafts. Double Bottom Tanks: tanks situated in the vessel’s double bottom and used either for bunkers or ballast water. Draft: depth of water from the water surface down to the bottom of the ship’s keel. 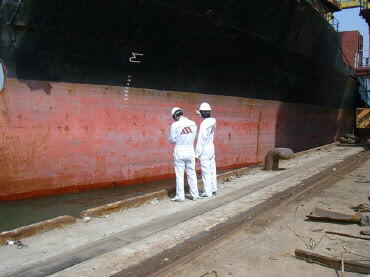 Draft (Draught) Survey: a system of cargo measurement based on measuring the draft of the vessel before and after loading or discharge, making into accound any changed in weight other than cargo, which may have taken place during cargo handling operation, i.e. changes in the weight of water ballast, bunkers, stores etc. Forepeak Tank: a compartment situated at the extreme forward part of the vessel often used to contain ballast water. Forward perpendicular (FP): an imaginary vertical line, at right angles to the keel and passing through the point where the summer loadline intersects the vessel’s stern. Freeboard (assigned or statutory): the distance from the upper part of the deckline to the summer loadline as “assigned” or stated in the Freeboard Certificate relating tho the vessel concerned. Hogging: the deflection of a cessel loaded in such manner that the draft amiship is less than the mean of the forward and aft drafts. Hydrostatic Curves: a document specially prepared for each vessel indicating, among other things, the centre of floating or “tipping centre” at various drafts. LCF: Longitudinal Centre of Floatation. Length Between Perpendiculars (LBP): distance between the forward and aft perpendiculars measured parallel to the keel. List: inclination of the vessel from the vertical position measured at the longitudinal midships axis. Lightship Weight: the weight of vessel ofter completion of construction but without fuel bunkers, stores, etc. Mean Forward Draft: average of the forward drafts on port and starboard side. Mean Midships Draft: average of the midships drafts on port and starboard side. Midships: longitudinal center of the vessel as indicated on the hull by the Port and Starboard loadline marks. Moment To Change Trim 1 cm (MTC): the force required to change the trim of a vessel by 1 cm. Plimsoll Line: another name for summer load mark. The line permanently marked by centre punh, or by welding, on the port and starboard sides of the vessel amidship. Port Side: the left-hand side of the vessel as seen by an observer facing forward. Rudder Post: the vertical axis around which the rudder turns. Sagging: the deflection of a vessel loaded in such manner that the draft amidships is greater than that the mean of forward and aft drafts. Sounding Pipe: a fixed pipe through which soundings are taken. Sounding Tables: a table containing the tank volume as taken measured by sounding. Starboard Side: the right-hand side of the vessel as seen by an observer facing forward. Stem Correction: correction applied to the mean forward draft when the forward draft marks are not situated at the forward perpendicular. Stern Correction: correction applied to the mean aft draft when the aft draft marks are not situated at the aft perpendicular. Summer Loadline: an imaginary line, parallel to the keel passing through the upper edge of the summer mark which corresponds to the maximum draft permitted in the summer zone in sea water. Ton Per Cm Immersion (TPC): the number of metric tones required to change the mean draft of a vessel by 1 cm. Trim: the difference between the mean draft and the mean draft forward, both measurements having been corrected to the aft and forward perpendiculars (FP/AP). Trim Corrections: corrections applied to the displacement of the vessel is not floating on an even keel. Ullage: the distance between the surface of a liquid in a tank and the top of the tank or corresponding sounding pipe. Ballast Tanks: két ballast, két được thiết kế đặc biệt để chứa ballast (nước dằn). Boiler Feedwater Tanks: két nước cung cấp cho nồi hơi. Bilges: nước bẩn đáy tàu, được chứa tại đáy của buồng máy hoặc buồng bơm, nơi được cho phép gom lại. Nước bẩn này luôn bao gồm cặn dầu, không được xả trong giới hạn cảng. Đối với giám định mớn nước, số lượng nước bẩn này phải được kiểm tra, đo đạc trước và sau khi trả hàng, mọi thay đổi về lượng nước bẩn cần được biết. Bunker tanks: két nhiên liệu, là két chứa dầu nhiên liệu cho máy chính và các máy móc khác. Calibration Tables: bảng hiệu chỉnh (xem sounding table). Centre of Floatation: điểm mà khi chênh mớn thì tàu dao động quanh nó. Là tâm của diện tích đường nước. Đọc cuốn Ship Stability for Masters and Mates đi, đầy nhóc luôn. Sếp rảnh dịch giúp bọn em với.Chứ tiếng anh lôm côm dịch sai thì toi. @diadoi345 ﻿đã viết: Sếp rảnh dịch giúp bọn em với.Chứ tiếng anh lôm côm dịch sai thì toi. có sách tiếng việt Ổn định tàu dành cho Capt và Mates đó, sách này do PGS.PTS Trần Đắc Sửu dịch từ cuốn tiếng Anh ra. hiện tại mình không có file đó, chỉ có sách thôi, nếu bạn có nhu cầu thì có thể liên hệ mình (vuphonghcm@gmail.com) để photo. 1. Tên két mà viết tắt như thế này: B.T (C) được hiểu là Bilge Tank (Center) để phân biệt với C.B.T (két nước dằn sạch) và B.T có tương đương với B.G.T không? 2. Khái niệm Slop tank chỉ có trên tàu dầu thôi phải không? 3. Tên két mà viết tắt như thế này: L.O.S.T (C); O.B.T (C) là két gì? Nguyên bản tiếng Anh là gì? Ai biết xin chỉ giáo. Cảm ơn!